The Dash 8-100 is a pressurized 37 seat twin-engine turbo-prop medium range regional airliner. The aircraft is capable of operations on both paved and unpaved strips and is equipped with self-contained boarding air stairs to provide independence at remote airfields. The Dash-8 100 is powered by two Pratt & Whitney PW121 engines. The engines feature low fuel burns, providing impressive operating metrics for an aircraft in this category. The aircraft is fitted with a galley, large baggage compartment and toilet facilities. The Dash 8 100 is equipped with modern avionics, including weather radar, EGPWS and TCAS II. 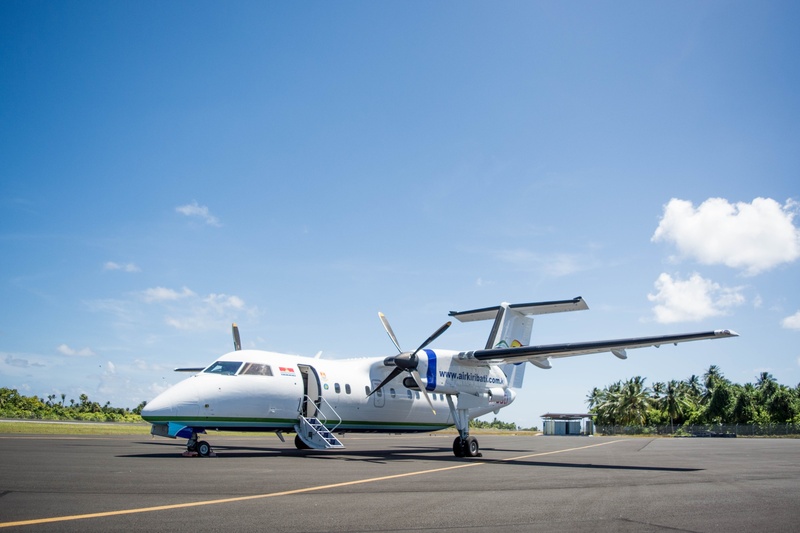 Air Kiribati currently operates one Dash-8 100 aircraft which is combi-capable and can be configured either in full passenger configuration or in a manner that would support the transport of both passengers and freight. Max operating speed at 20,000 feet is 223 knts with 242 knts max cruise below 14,000 feet. The Twin Otter is a high winged, un-pressurized twin engine turbine powered aircraft with fixed tricycle land gear. The aircraft was designed as a rugged commuter and is capable of carrying passengers and cargo into remote unimproved locations, including ski and water-based operations. The 19 seat twin-engine turbo-prop utility aircraft is powered by two PT6A (-20/-27) turboprop engines. The Twin Otter is commonly classified as a Short Takeoff and Landing (STOL)-capable aircraft, being capable of operating from short and rough runways in all climates. This capability has been largely attributed to the Twin Otter’s high rate of climb and design features including its double slotted trailing edge flaps and ailerons that work in unison with the flaps to boost STOL performance. 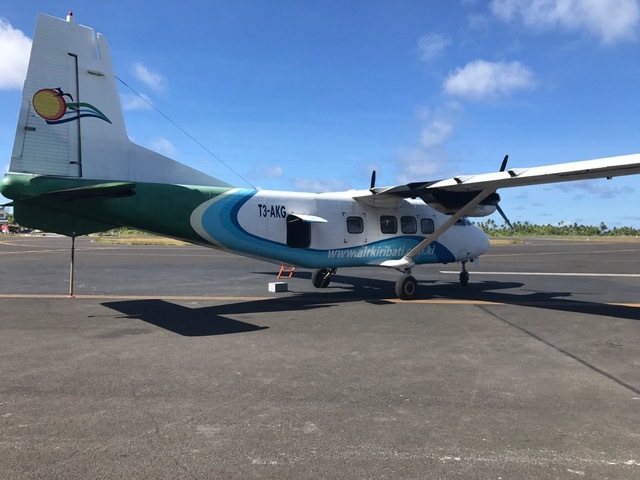 Air Kiribati currently operates one Twin Otter configured in full passenger configuration. The Y-12F turboprop aircraft is designed by Harbin Aircraft Industry Group (HAIG), part of Aviation Industry Corporation of China (AVIC), for regional use with a spacious cabin that can accommodate 17 passengers. The Harbin Y-12F features APEX avionics from Honeywell in the United States, PT6A-65B turbopropeller supplied by Pratt & Whitney in Canada and HC-B5MA-3/M10876AN low-noise, five-bladed propellers supplied by Hartzell in the United States. Air Kiribati currently operates three Y12s with one based on Kiritimati (Christmas) Island servicing the Line Island Group.